NEC LCD4620 LCD TV gives a ‘WOW effect’ on video and audio features with maximum impact. The ‘Digital Signage Technology Suite’ display touts an ultra thin bezel, a built in expansion slot and HD resolution with the most of the advanced features. The screen size is 46 inches. The technology type for NEC is TFT active matrix PVA LCD display technology. The resolution is 1366 x 768 pixels and the display format is 720p with the image aspect ratio of 16:9. The colour depth is 24 bit (16.7 million colours) and the image contrast ratio is 1200:1 with brightness of (700cd/m2). It has the widescreen format of 16:9 with pitch pixel of 0.648 mm and the pixel response time is 8 ms. The maximum H-Sync rate is 91.1 KHz hertz and maximum V-Sync rate is 85 Hertz. It provides a viewing angle of 178 degrees from all the corners of a room with colour temperature control. The video features of this NEC TV are analogue video input signals like NTSC, PAL and SECAM with input video formats like 1080/60p, 1080/50i, 480i, 480p and more. It accompanies with an infrared remote control. The sound output mode is stereo type with 30 Watt of external amplifier power. NEC LCD4620 provides internal power supply of AC 120/230 V (50/60 Hz) with power consumption of 300 Watt. It also contains video interfaces such as HDMI, S-video, component, composite interface and PC interfaces like DVI and VGA (HD-15). It is HDCP compatible. The dimensions of this product are 92 cm in width, 14 cm in depth and 53.2 cm in height. The weight of the product is 31.1 Kg and the colour available is pure black. The manufacturer warranty is provided for three years and the cost of this product is £1,944.87. With all 20 plus adjustable features, this NEC LCD TV offers an outstanding and unimaginable functions. 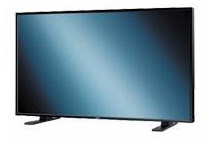 Checkout LCD Screen Reviews on Dell, Hitachi, Goodmans and Sanyo LCD Televisions at LCD TV Reviews site.